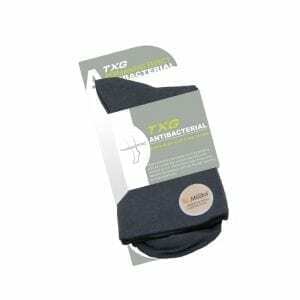 TXG NZ Sports Compression Socks (sometimes called Sports Support Socks) are ideal for both casual exercise participants and professional athletes. They improve endurance and efficiency during movement while also reducing the risk of injury and post-exercise recovery time. Wearing these socks during vigorous exercise improves circulation while reducing the micro damage that occurs in the muscles during repetitive, jarring movement. While they do this, they also help to increase oxygen intake in the same area, as well as improve lymphatic function. 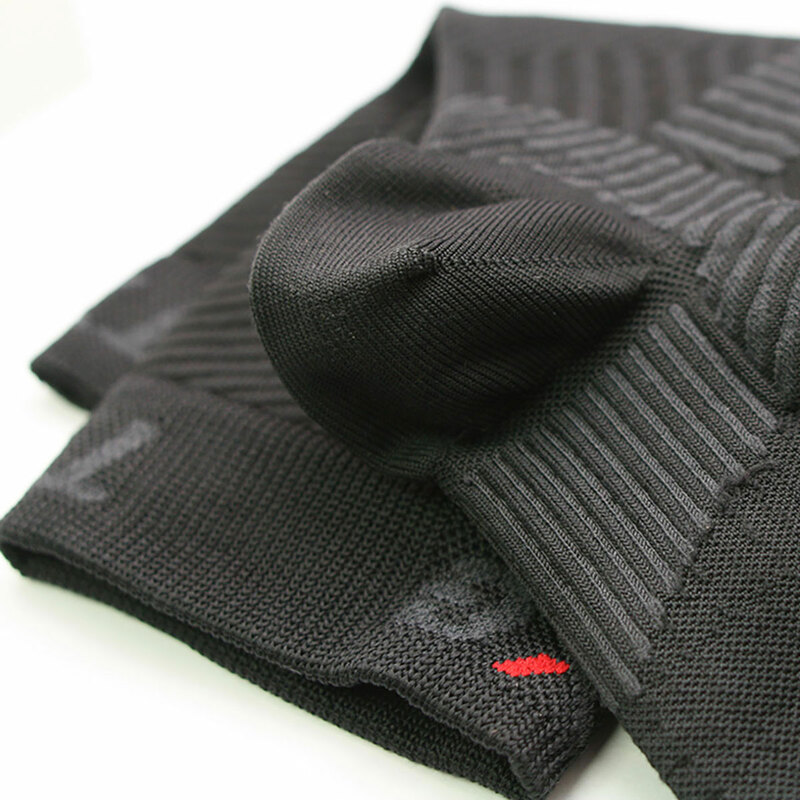 We’ve integrated Coolmax high-performance fibres into these socks to ensure that they’re breathable and stay dry during vigorous exercise. We’ve also added extra padding on the soles for added shock absorption and a patented X Pattern to provide support to the ankles. Snug support of the leg muscles, greatly reducing jarring stresses and micro tissue damage that can occur during vigorous exercise. 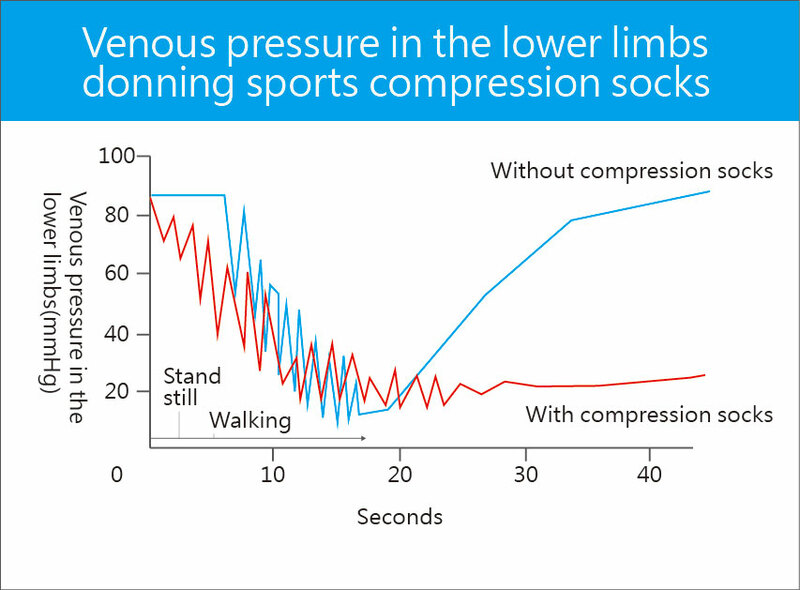 Graduated compression over the legs is beneficial for increasing oxygen intake and transfer to muscle cells. Relieves aches, swelling and tension in the legs. Designed for those who require extensive ankle joint movement and protection of the lower limbs. 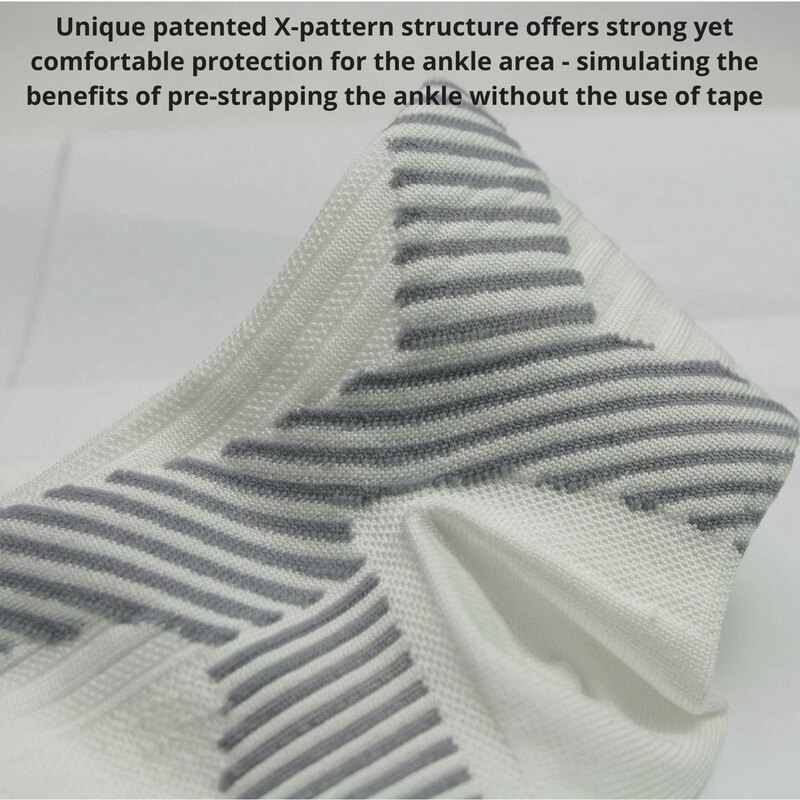 The powerful elastic fibers are designed to bundle the joints with X-patterned design as extra natural protection to reduce the incidence of injury. 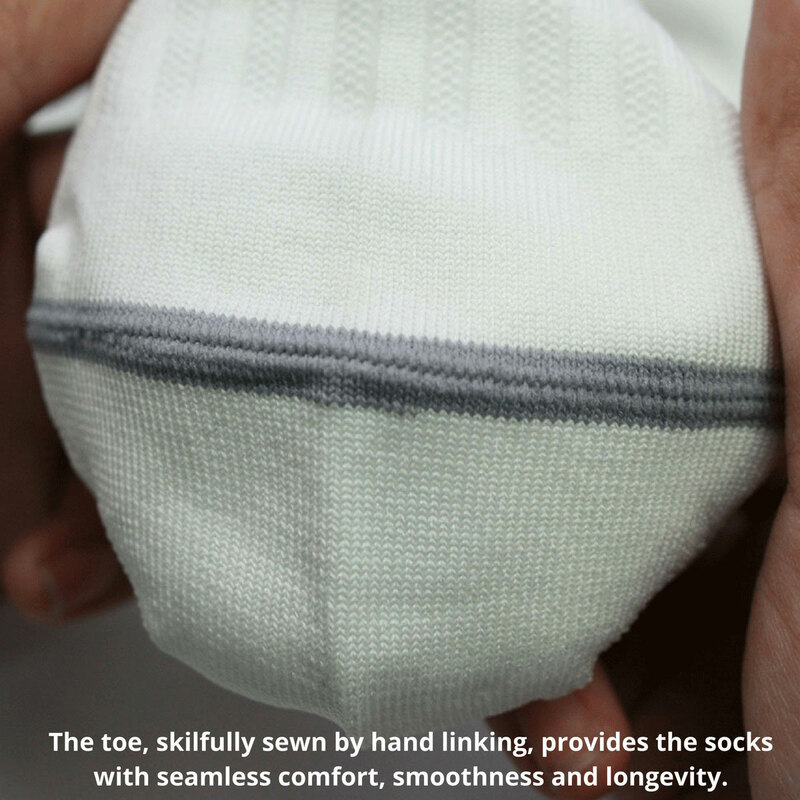 The toe, skilfully sewn by hand linking, provides the socks with seamless comfort, smoothness and longevity. Moderate (15-20mmHg) – Medical research indicates this compression level is an ideal combination of comfort and prevention of swelling in feet, ankles and legs during sporting activities. 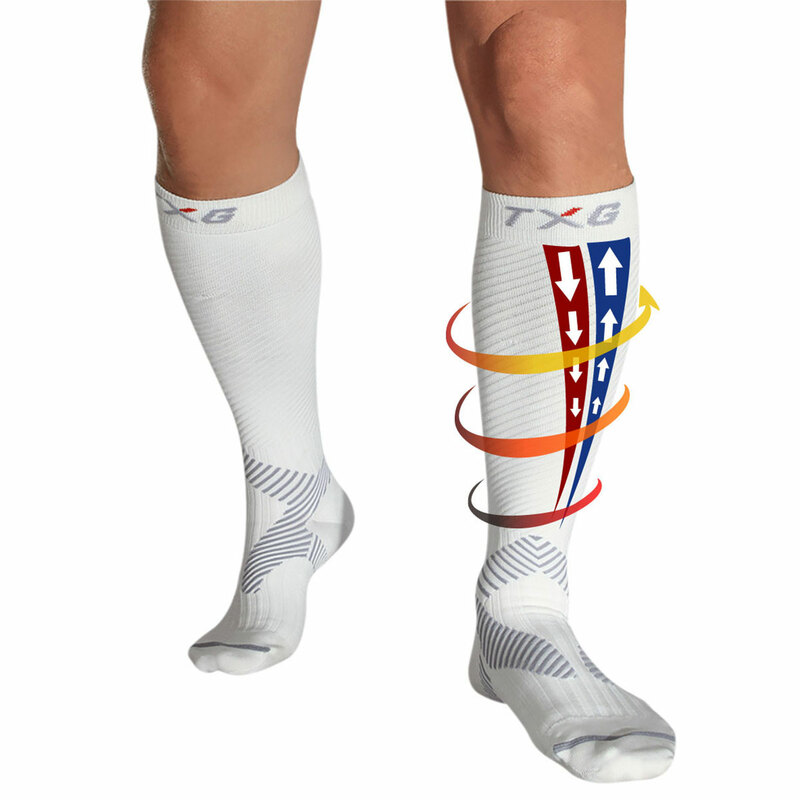 Ready to experience the benefits of TXG Sports Compression Socks for yourself? 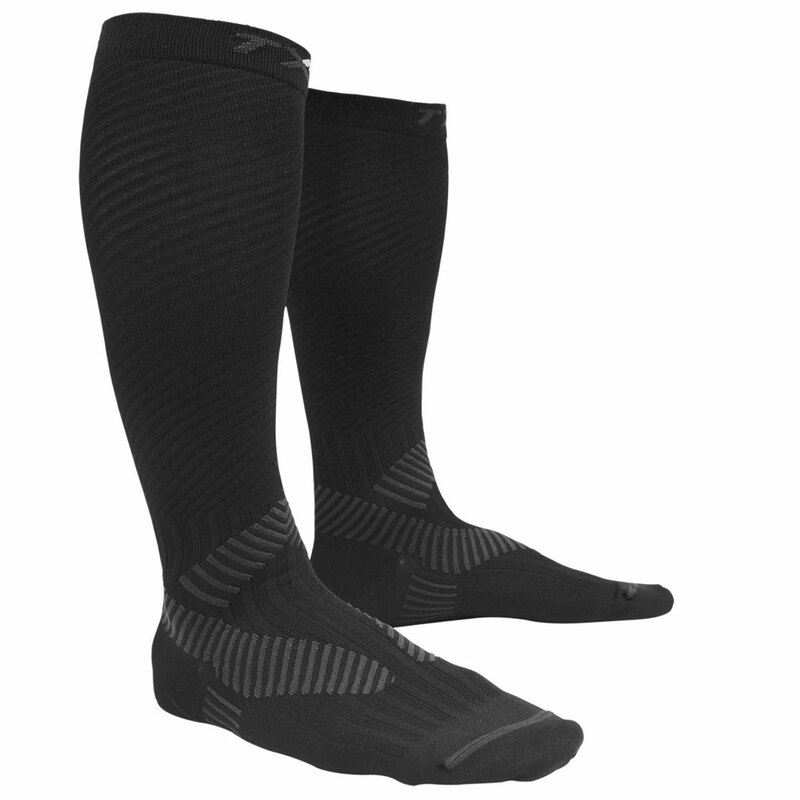 These are the best sports socks for you if you’re looking for socks that will give you all the benefits of graduated compression; prevent injury, boost performance and aid recovery. Simply choose your size, compression level, colour and add to cart at the top of the page to have your TXG Sports Compression Socks delivered to you anywhere in New Zealand with our free 7-day standard delivery, or you can upgrade to Express 2 to 3-day delivery for just $5.99. Rural deliveries take an additional 2 to 3 working days. I Suffer from swelling with my right ankle – as a result of having an ankle replacement. I wear my socks when doing exercise eg: golf as I find that they give better compression than the standard compression stockings I use. Also as they are white they are more sporty looking so I wear on both legs – and they are less obvious. 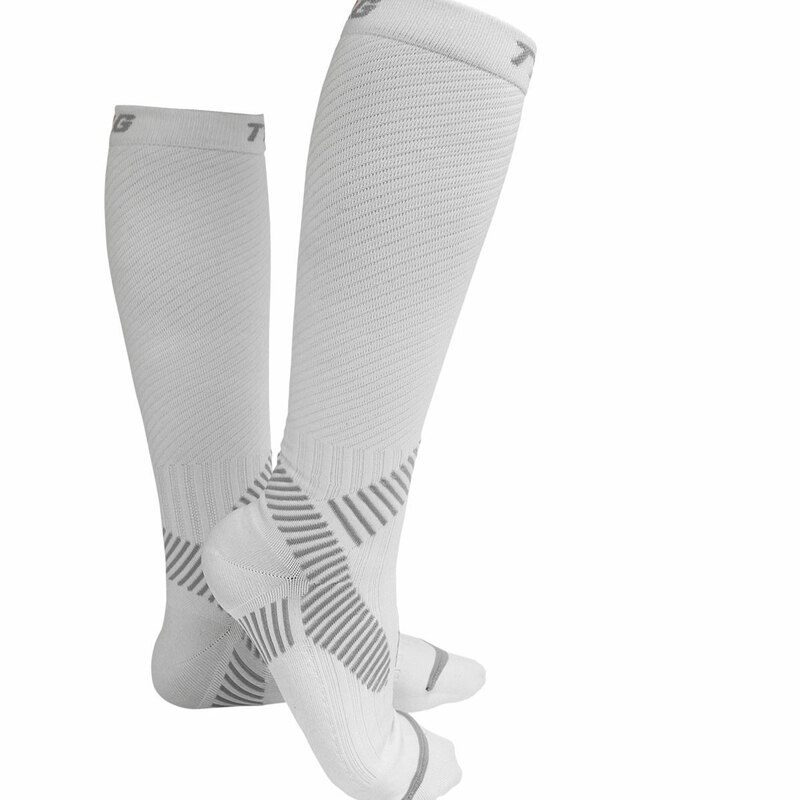 I would absolutely recommend the TXG Sports Socks as they are very high quality and your people are very helpful!! Hi thanks, my socks arrived and they are great. I wear them as support when I am playing competitive Tennis as it holds my cramps off to finish my matches. Much appreciated. My socks arrived and they are great! I wear them as support when I am playing competitive Tennis as it holds my cramps off to finish my matches! I ordered the sports socks because of the extra ankle support (as I recently tore the ligaments in my ankle and I was looking for some support when I get back into exercise). Once you get the socks on the support is great, firm, encompassing and feels almost like strapping. The challenge is getting them on, I think a larger size would be a lot easier to get on. Thanks for the personal style messaging and the quality of the product. I purchased the sports socks because I was suffering from lower leg cramps, I have only worn them twice, but my legs felt very secure and comfortable. 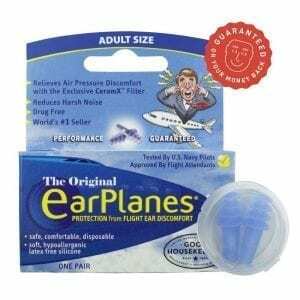 They are high quality as is customer service. My sports compression socks have been on for a few days and are helping with the gravity induced soreness with my varicose ulcer. Many thanks. And they are a good fit. A broken ankle injury from back in Janurary 17 started flaring up again. They did an MRI and all was good but it was swollen again and a bruised colour. The sports compression socks definitely helped with the swelling. I would recommend them as they are great for swollen ankles. My sports compression socks are high quality and a lot firmer than the compression socks issued by the hospital. I found them very hard to get on with a broken hip. I’m not sure how an elderly person would get on as my wife struggled to get them on. Great website and the packaging was a hoot. Can I please order 2 more pairs of the sports compression socks from you? These have been invaluable for me and has kept me injury free. We have all come back from the latest round of long haul flights to and from the USA. The socks appear to have done their job. So that’s a good thing. I have rarely seen such customer service in any industry. God bless you and may your business flourish. I wore TXG sports socks in the Coast to Coast race for the 3km run off the beach, the first 55km cycle, the 30km mountain run, second 15km cycle and 1km run to kayak so that is 8 hours of a nearly 17 hour journey. The only reason I took them off before getting in the kayak was that I wear split to kayak booties otherwise they would have been on until the finish. I experienced no problems with calf cramping during the race or after. As previously mentioned I find them more effective than your competitors product I have used. They have a higher level of compression, stay up when crossing rivers and the support bands in the ankle region means for the first time ever I did the run with no uncomfortable tape strapping of my ankles. I am pleased with your products. I had compression socks for years wearing them constantly when competing in long distance triathalon and trails. With age, I am slowing down in my sport routine but still keep some action. I am very impressed with your marketing and reactivity to customers and orders, your documents and letters are nice. This is my second order of Sports socks. I have been training for Coast to Coast One Day and finding them very good. They are better than Skins or 2XU as they stay up in the river crossings and also have ankle support which the others lack. I like the foot support and the comfort in the sports socks. I heard about your socks from one daughter and have since told another about them, she plays netball and straps her ankles for every game. I would like to take this opportunity to thank you for “going the extra mile” in customer service. I have seldom experienced such personal and caring service. I will have no hesitation in recommending your business and products to family and friends. After me being on my feet for 24 hours and wearing the TXG compression socks for that length of time; my legs didn’t swell or even feel sore. I wasn’t as physically tired either as I usually would be after being up all day then working a 12 hour shift at hospital… such a long time 24 hours … The socks are wonderful and far exceeded my expectations. I’m only sorry that I initially wasted my money on “so called” compression socksbought elsewhere before I found your brand. Normally my legs would be swollen and quite sore. Your socks have been such a comfort. I am just so pleased with the results. Your product is fantastic but it’s your marketing that is truly exceptional. I have enjoyed the whole experience of buying the socks from the first email, the notes and personalised cards, right through to the surprise gift. I read the email out to our entire office and the reaction was superb, everyone decided these were the best socks out.